A crashing plane with only one engine, a train going off the rails, a hot air balloon malfunctioning thousands of feet in the air… Superman can and does stop them all. That's what he does on a daily basis. But this time, everything is different. Planet Earth is still being sucked into the Phantom Zone in SUPERMAN #3, and everything has gone to complete and utter hell. All the other superheroes are quickly getting poisoned by the Phantom Zone atmosphere mixing with the Earth's atmosphere. The brightest scientific minds on the planet don't know how to stop the Earth from ripping itself apart in the Phantom Zone. We finally do know how this happened, though—it’s just a S.T.A.R. Labs experiment gone wrong. But things are so far from okay that Ray Palmer is freaking out about how if they find a way to get Earth out of the Phantom Zone (and that might be a stretch at this point), the planetary damage suffered already could be irreversible. Things are really, really bad. And amidst all this chaos, Superman finds the time to scold some good ol' fashioned looters. I can't. Y'all. I really, truly can't. Stop. Laughing! Earth is in literal hell, and Superman thought it was the best use of his time to take a few precious seconds—seconds that could have been spent figuring out how to save the planet—to yell and reprimand some regular old electronic store looters. Three short sentences: "Put it down! Cut it out! Now!" That's all it took for the 30 or so seemingly normal citizens to hang their heads in shame, turn around and return the televisions, microwaves, gaming consoles and other five-finger-discount gifts they'd lifted from abandoned stores. This moment was so utterly random that it stopped me short. And I kept reading the panels over and over again. It was so perfectly Superman. The world is ending, but he's got to teach some misbehaving humans a quick lesson. Truth, justice and the American way apply to situations both epic and small. Superman has always been the calm in the chaos, and this moment is the perfect example of how…well, how perfect of a hero he is. He doesn't judge a situation based on how big an impact it’s making. He just jumps in and saves the day, then moves on to the next. The world is ending, and yet he still brought justice to this small scene. Any injustice taking place is one that deserves his attention. People weren't dying, but this looting deserved just as much focus as a malfunctioning plane about to crash into a city street. And I am super here for the confidence Superman has as he flies away without even checking to see if the looters listened to him. They did, of course, because that is the respect Superman has earned from humans. And rightly so. This is basically Superman's version of walking away, unflinchingly and without a second glance, as something explodes behind him. Now that's some BDE. This all took place on only one page of Superman #3, and between that issue, ACTION COMICS #1003, SUPERGIRL #22 and ADVENTURES OF THE SUPER SONS #2, there were four action-packed books released this month. And yet it's this one almost comical page was my favorite moment of all four books. Not sure what that says about me, but I'm very quickly learning that what I'm drawn to in comic books are these smaller moments that pack a much more impactful punch than the big brawls or universe-threatening moments. Maybe it's because a comic book is the only medium in which moments like this can happen, and are given the same attention and space as the "more important" moments. In television and film, minutes and even seconds are so precious. One shot can cost millions of dollars. It takes a pretty penny to pull off CGI and VFX. But in comics, every panel is treated the same no matter what happens in them, so the writers and illustrators can have more fun. They can create large and small moments, each with an equal impact. Maybe I'll be more moved by the climax of some huge fight in space next month, but so far, it's these one-off moments that are continuing to grab my attention and refusing to let go. And I can't be the only one, either. 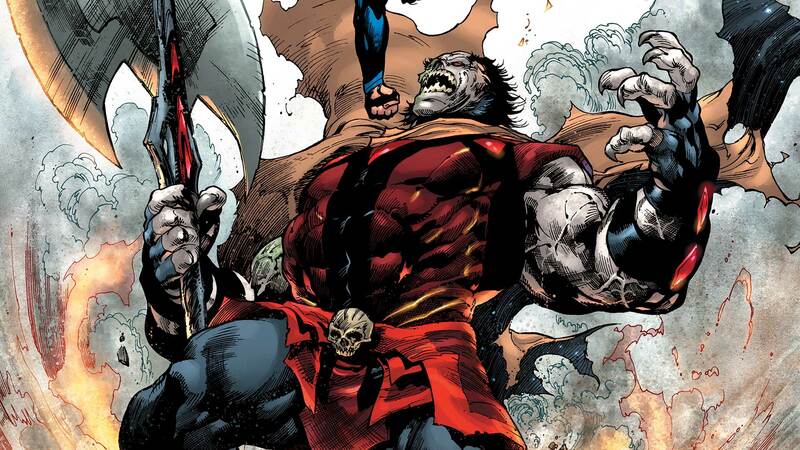 What was your favorite moment from all the DC comic books this month? Sydney Bucksbaum covers Superman and the DC Universe as a whole for DCComics.com. Follow her on Twitter at @SydneyBucksbaum.